Hey, everyone! I've been positively swamped with work these past two months, which is why this place is even quieter than usual. I don't know when will I have time to get back to some serious posting, but it may be the second half of February, or even March. Being an adult is annoying. But it has its perks, too. Seeing as we're well into the carnival right now, I am feeling festive, and even if I won't be doing any partying of my own, I hope you will. And for that reason, I've decided to whip up this quick guide on how to match wine to food for a satisfying experience. Most people know that white wine goes with white meat and red wine goes with red meat, but what about vegetable dishes? What about cheeses? What to do? How to cope? Wine aficionados can get pretentious, and once you delve into the subject of wine, it often gets needlessly complicated, with florid terms that don't really tell you anything. Therefore, many people swing the pendulum too much the other way, insisting there is no reason to give any thought to wine matching, and anyway it's all the same, and did you hear the "experts" gushed over some cheap wine provided it had a snobbish label on? The truth, as usual, is in the middle. You don't have to buy the most expensive wine and you don't have to pass an online course to choose a good wine, but it is a good idea to make at least some effort. White wine is served for fish... but not if it's syrupy Muscat. Observing the few basics will give you a better experience, and it's not really that hard. Equality, in the context of wine, means pairing a strong wine with a strong dish. I don't mean the alcoholic quotient: in this case, "strong" means "rich in potent flavours." If you made pork roast heavy with rosemary and garlic, you need a wine that will be its equal in flavour strength - probably a dark, rich, red wine. If you have steamed salmon with just a pinch of butter, you need a light, delicate wine that will not overwhelm the fish. I always advise people to simply get to know a few wines easily available to them (at the nearest shop, in their price range etc.) so that they know how each of them tastes and are ready to match. Works wonders. Note: when matching tastes, match the overall effect, not just the main ingredient. You can use cod to make delicate dishes of sautée fish and lemon, or you can use it in a powerful fish curry mix. 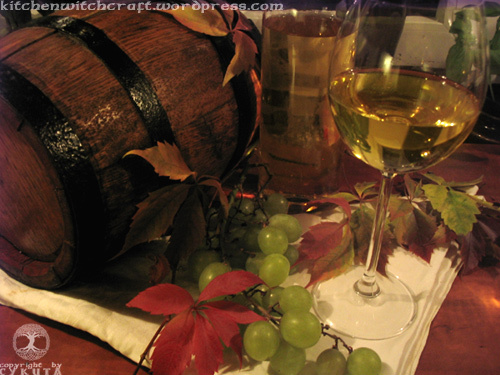 The existence of sweet wine is a bit of a problem, culinarily speaking. It doesn't really work with any food - people say it's for desserts, but when you're having dessert, coffee, tea, liqueurs or champagne are so much better than any sweet wine. Sweet red wine can be mulled, and that's nice. Sweet white wine... well, if you enjoy the taste, drink it alone, but don't expect it to pair well with food. Semi-sweet white wines can sometimes work with vegetable-only dishes, but they won't achieve anything that a semi-dry couldn't. Wines from a given region of the world will usually match well with foods from that region. And, in the era of the Internet, you can find out very quickly what wines are typical for the weird region where the weird cheese you bought as an experiment comes from. And even if you can't get your hands on the wines from the region in question, you can at least get the idea of what type or taste is supposed to go well with it. Also somewhat on this subject, dishes that require wine as one of their ingredients (risotto, coq au vin etc.) 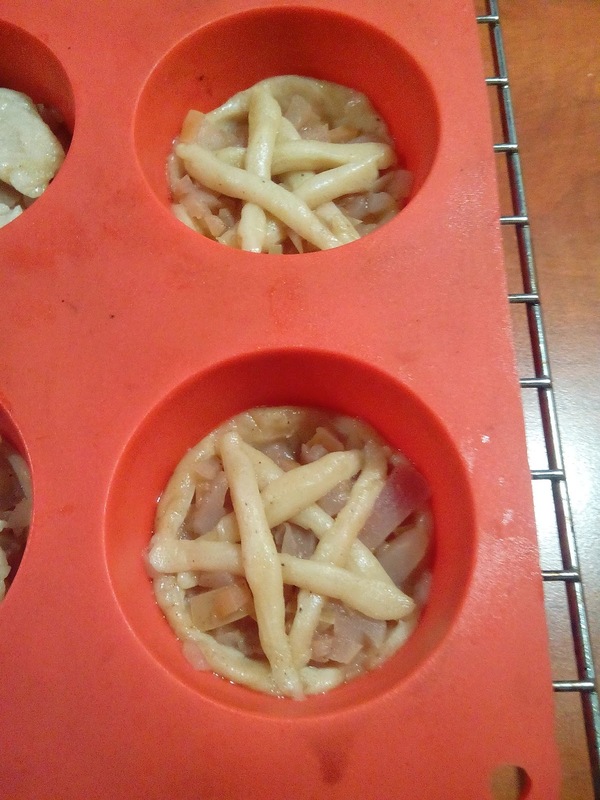 should be served with the same wine you chose for cooking. When choosing the wine as an ingredient, refer back to this same guide. That's it! Now go and wine someone. 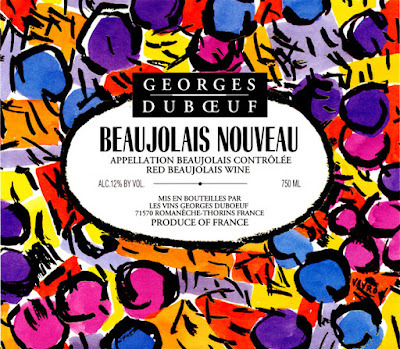 The third Thursday of November brings us this year's beaujolais! This rather unique wine, contrary to the popular saying that* wine gets better with age, is only suitable for drinking when young and fresh. 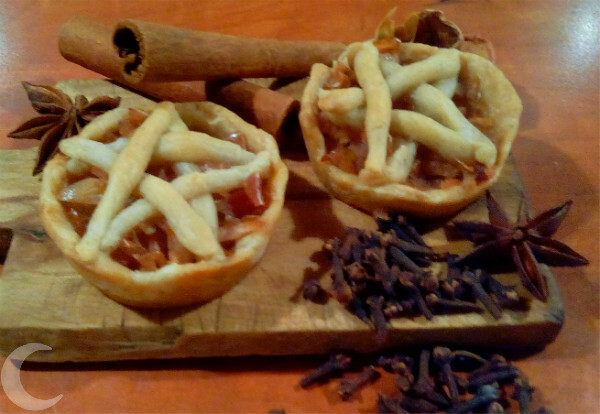 It does not keep very well and has a distinctive, light taste that makes it unsuitable to many "heavy" dishes. It is made from Gamay Noir grapes using the carbonic maceration technique, which is responsible for the light, fruity taste. 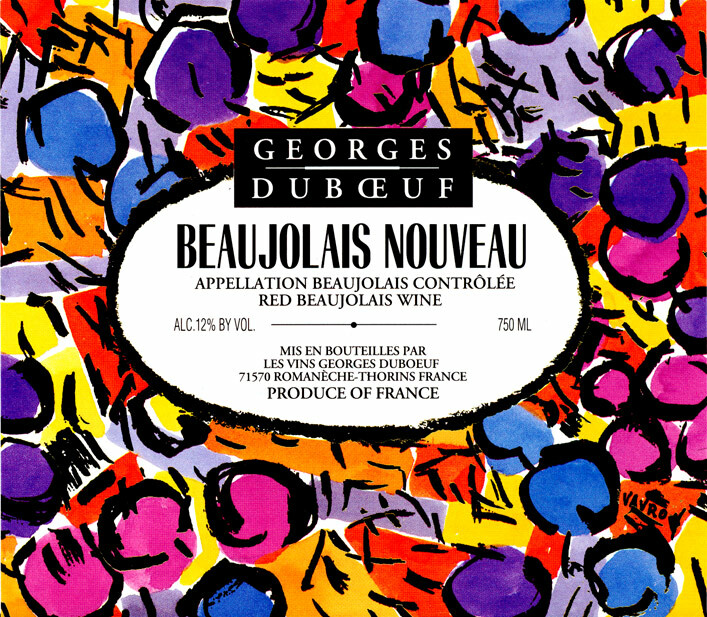 Because of the nature of this process, beaujolais nouveau must be pasteurized. The ephemereal nature of this wine has been the chief reason for its festive, cheerful image. Since it has to be drank fresh, the usual practice is to organize parties at which the current year's harvest is consumed, and the Beaujolais day, the aforementioned third Thursday of November, marks the first day of the year when the wine can be sold. Restaurants and vineyards all around the world offer Beaujolais nouveau for degustation, and organize local versions of the fête. Interestingly enough, the second largest fan of the wine - after France, of course - is Japan, but Beaujolais Day is celebrated pretty much everywhere. Part of the reason for my writing this here is the fact that I'll be attending one of those this evening. Hopefully You will have something great to drink as well, since today is a day to celebrate. * This is quite a common misconception. That is to say, wine can be stored for long periods of time, and often will mellow and enrich the taste. The process is called aging. 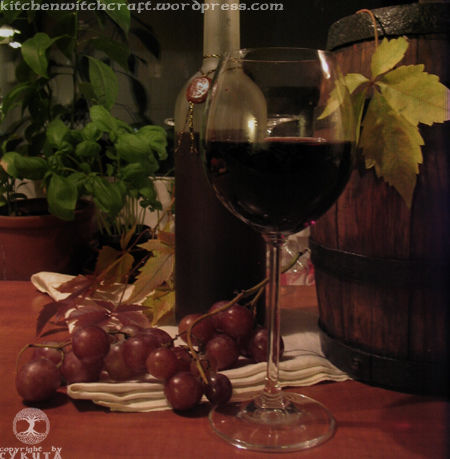 However, the actual period over which a wine can be safely left to age depends on many of its characteristics. Rosé stores badly and should be drank more or less immediately, and white can be stored, in most cases, for about two or three years, depending on alcohol percentage. Red is the most durable, but five to eight years is the maximum shelf-time You should allow. This is because wines that are meant to be left for aging tend to be bottled separately, with different techniques and at a different point of the manufacturing process. Aging wine in bottles will always be inferior to storage in barrels, which, in some cases, can reach about 200 years. However, You should not expect the wines on Your kitchen shelf to keep that long. 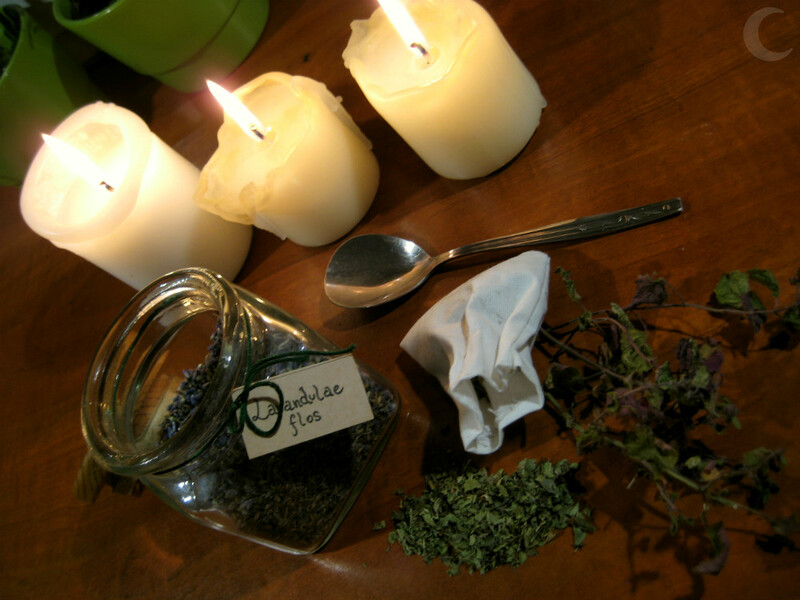 This simple potion is my go-to thing when I need some peace of mind. I drink it, I bathe in it, I use it as a component in rituals. Given that it's technically a herbal decoction, it may also be labelled "tea," I guess, but due to the intended use I tend to think of it as a potion. Put a pot on the stove and boil the water in it. When the water is boiling and bubbling, keep the heat on. Add the first herbal ingredient and reduce the heat so that the water calms a bit. Add a second ingredient, and further reduce the heat. Add the last ingredient, stir them together, and turn the heat off completely. Cover the pot and leave it to infuse. For maximum effect, let the potion cool off completely before use. This is not strictly necessary, however, and for some purposes (such as baths) may be undesirable. You may add chants, gestures, or other ritual components to the process as you add the ingredients. Or not. Whatever feels right to you. So when the spinach starts to wilt just a little, and get all sad and lonely in the fridge, I use it for my Druidic Dumplings. There are two simplest variations of this dish: the Italian, gnocchi-like one, where the other ingredient is mashed potatoes,* and the more Slavic one, where the other ingredient is quark cheese. What you will get here is the second variation, because the potato variation requires all that peeling and boiling and generally more work. Clean and chop the spinach. 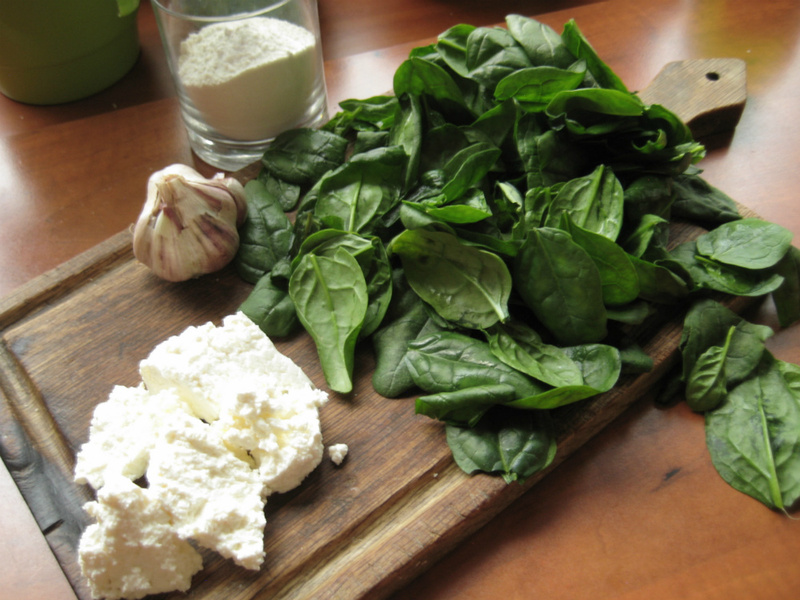 Heat up a tablespoon of olive oil in a frying pan and blanch the spinach with garlic. Set it off to cool down. When it's cold, put the spinach in the food processor with the quark cheese and blend until you get a lovecraftian-looking green mass. 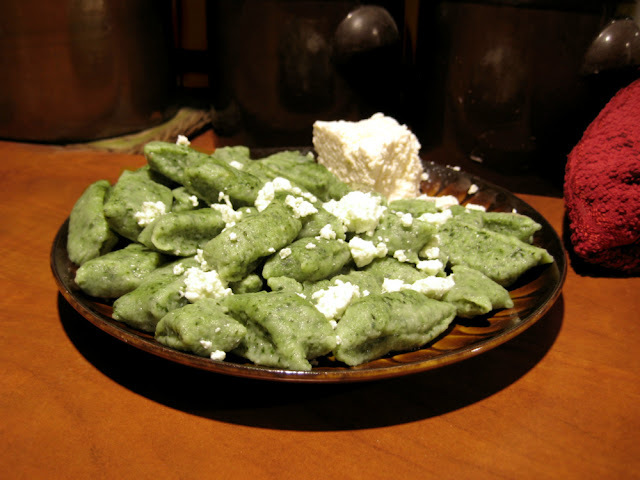 Mix the lovecraftian-looking green mass with flour and egg until you have a firm but flexible portion of soft dough. In a pot, boil a large amount of water with a teaspoon of salt. Roll your dough into a long strand, then use a knife to cut off small-ish, even portions. Dump them into the boiling water, and stir very gently. Boil for about 3-4 minutes. Take one out and cut in half to test before you take them all out. Since it's spinach-based, I like them most with the same sauce I use for my penne primavera - based on feta cheese and tomato. But if they're done well, they're just as good with just a bit of butter, a spoonful of cream, or just some leftover quark cheese crumbled on top. They go very well as a side dish for meat stews, too.